Crowdestate has a long record of having a good offering of real estate crowdfunding projects. They have performed well over the years and they have almost 30,000 investors on board. Crowdestate is a crowdfunding online platform for real estate that was founded in Estonia. In addition to offering a vehicle for investors to get involved in real estate projects across the world, they also have a mortgage loan and corporate finance offering. They have been in operation since 2014, with the first of their investable projects coming to light in May 2014. Since then, they have gotten nearly 30,000 investors on board for 145 projects. In that time, more than €60 million has been raised in that time. The average return during this period was 18.73%. Crowdestate aims to offer complete transparency to their investors by providing them with as much information as possible about potential investments. Their expert team has already vetted the potential investment in advance, saving you a lot of time in the process. You only have to invest a minimum of €100 with Crowdestate. This makes it great for beginner investors. The team of experts on the platform take their time pre-vetting all investments. Therefore, the ones that get approval are usually of a high quality. You can take a hands off approach and simply get the platform to automatically invest your funds according to your pre defined criteria. You have a lot more liquidity with your Crowdestate investment as there is a good marketplace for liquidating your investment before the time period elapses. Most new projects quickly get funded and there is often more demand than the supply of projects. For the real estate investments on Crowdestate, there is no monthly cash flow for investors. Our close relationships with different local real estate developers and brokerage companies give us access to a large number of off-market real estate investments. Only the best investments surviving in our rigorous due diligence process are published for investing. One of the standout aspects of the Crowdestate offering is that you can start investing with as little as €100. This is a lot lower than most of their competitors and allows beginner investors to get involved without having to make a significant investment. Another standout with the Crowdestate offering is that they have a reputable history of success. You are able to look through their past projects and see what level of return thy provided for their investors. With almost 30,000 registered users, they certainly are a reputable offering. Their platform is very simple and easy to use, while having all of the features you will need to make well thought out investments. One of the areas that Crowdestate could improve upon is bringing more projects to the platform. While they certainly like to make sure that they properly vet all potential investments, some investors say that they would like a bit more variety than is currently on offer. When a new project hits the platform at the moment, it can get fully funded very quickly due to the limited number of available projects. There is also no monthly cash flow for those investing in the real estate projects. This is something that is on offer with a lot of other similar platforms. There are only monthly interest payments for the mortgage loans and corporate finance offerings. For investors, there is a success fee in place of the given investment manages to outperform the original defined hurdle rate. This success fee is usually about 20% of the gains above the normal hurdle rate of 8% annually. This success fee will be paid to the platform at the end of the life of the given investment. There are some other small fees depending on the type of investment you make. These will be disclosed at the time of making the investment. In terms of the features on offer with Crowdestate, you have a top quality offering across the board. Their portfolio of products is innovative and they are offered on an easy to use platform. Crowdestate aims to be very transparent, which is why they publish all relevant documentation relating to a given project. Through their pre-vetting process, they only give approval to about 5% of the opportunities they look at. This means that you can be a lot more comfortable when making an investment as these projects have already been strictly vetted. The process to getting started with Crowdestate is pretty straightforward. You start by signing up for an investment account. You will usually have to provide some proof of identity when signing up. Then you will need to add funds to your new account. Your investment can be as small as €100. Then you can carefully vet the opportunities that are currently on offer through the platform. This includes looking at all the relevant information about the given real estate opportunity and ultimately deciding if you want to invest. Projects will have different time lengths, expectations of return and risk profile. You decide how much you wish to invest and then confirm the agreement to invest. Once the project gets fully funded before the deadline, the transaction will be completed. If the project does not get funded, then the transaction will be cancelled. Any income from a given project will be proportionally distributed to the investors. You can withdraw these funds or reinvest them. If you wish to liquidate some of your portfolio before the investment period has concluded, there is a good secondary market on Crowdestate. You can sell your position in certain projects there. Alternatively, you can get involved in projects that were already funded but investors are looking to exit their position. Your portfolio will be clearly shown in your account. It will show your realized and expected returns for the projects you are involved in. There are three different investment products on offer with Crowdestate. The most popular types is their real estate investment projects. They also have a mortgage loan and corporate finance offering. You vet and invest in these products in a similar way to the standard real estate investments. However, there is a lot more limited choice with these options. You are also able to auto invest through the platform. You simply enter all of the criteria you are looking for in an investment and when an opportunity arises. 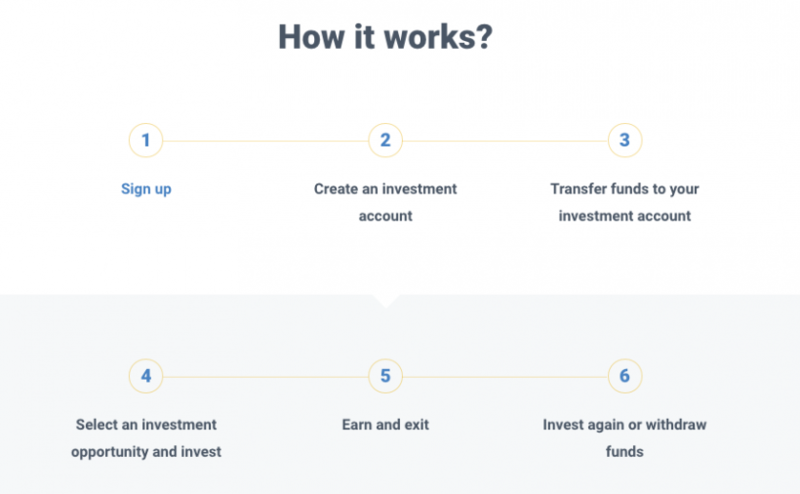 The auto invest feature will automatically get you involved in the investment opportunity. The only method available for many deposits and withdrawals to your Crowdestate investment account is by a bank transfer. Depending on the currency on your bank account and the specific bank you are with, there may be a small fee associated with making this transfer. All you need to do is select ‘Add Funds’ on your account and and you will be provided with the given banking information to make your deposit. A similar process allows you to withdraw funds from your Crowdestate account. If you have any questions or queries, your best port of call in the beginning is to refer to the wide-ranging FAQ section. This answers the majority of questions that you may have. Otherwise, you can send them correspondence to their Estonian office by mail or you can send them an email or ring them over the phone. There is also a live chat option on their website if you prefer more immediate help. Crowdestate has been operating in this sector since 2014 and they have strong historic results that back up their reliability. With almost 30,000 investors on board, they have a good track record of being reliable. All investor funds are kept in segregated accounts from those used for the operations of Crowdestate. Therefore, in the case of bankruptcy, the investor funds cannot be accessed by creditors. The investments as part of the platform are also kept segregated from the main operational business, which will keep your investments protected also. Investors looking for platforms with a good historic record. Crowdestate has funded many projects since 2014 and they have consistently performed well for their investors. Investors looking for liquidity. While real estate is usually the type of investment with the lowest level of liquidity, there is a strong secondary market on Crowdestate. Therefore, you can sell your investment to other users through this marketplace. Passive investors as there is an auto invest feature. This means that you can have the system use your pre-filled criteria to automatically make investments for you.